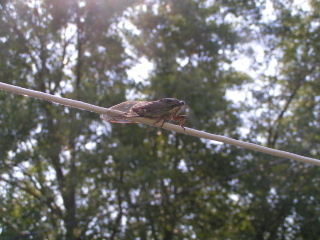 Cicada on the clothesline. How exciting! Aidan discovered the little creature and it didn't move a millimeter while I took several photos. Today we met up with my mom and cousin Rachel for a little shopping. I had a blood test to check my PT/INR and Aidan had a fit. He seems to not only get scared when he has to have blood tests but when I do, too, so I think I'll just find someone to watch him when my next one is due. Here's hoping I can move off the injectable Lovenox with the results of this blood test. 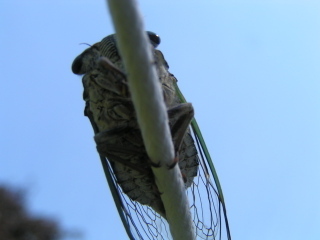 More pictures of the lovely Cicada after the jump! 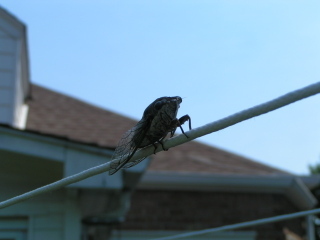 what beautiful lacy wings he has! oh, poor Aiden. What a love. Hope all is well with your blood test.